A képre történő kattintás után megtekinthet minden rendelkezésre álló fotót a (az) Huangjia Garden Hotel-hoz. 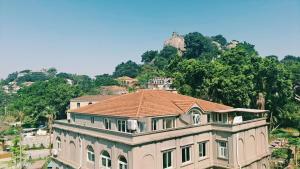 Accepting only Mainland Chinese citizens, Huangjia Garden Hotel is set in Xiamen, 1.7 km from Huangu Ferry Marina. The rooms are equipped with a TV. Some rooms feature views of the sea or mountain. All rooms have a private bathroom. Extras include slippers and free toiletries. Nanputuo Temple is 2.8 km from Huangjia Garden Hotel , while Xiamen University is 2.9 km from the property. Xiamen Gaoqi International Airport is 13 km away. Please note that due to local licensing guidelines, this property is only able to accept Mainland Chinese citizens. Guests must present a valid PRC Identification Card upon check-in. The property apologizes for any inconvenience caused. This property reserves the right to release the room after 18:00 on the day of check-in. Guests who plan to arrive after this time should contact the property directly. The contact information can be found on the confirmation letter. Payment before arrival via bank transfer is required. The property will contact you after you book to provide instructions. IMPORTANT: Due to local regulations, Huangjia Garden Hotel is only able to accept guests who are Chinese nationals. Guests must present a valid PRC Identification Card at check-in. If you are not a Chinese national, please choose another property.